Publisher: Appraisal Institute and The American Society of Farm Managers and Rural Appraisers 2000; Hardcover, 525 pages. Professionals involved in the appraisal of rural, agricultural, agri-business and resource properties have had access to a limited amount of relevant reference material. This situation has improved dramatically with the pbulication of The Appraisal of Rural Property, Second Edition, the most significant addition to rural appraisal literature in 15 years. This second edition picks up where the previous text left off, providing a comprehensive reference work that covers all aspects of the valuation of rural properties from both theoretical and practical perspectives. 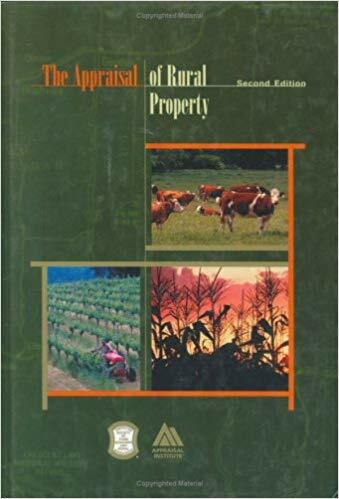 The text explores all the factors relevant to rural properties, from neighborhood and regional analysis to soil, range and productivity analysis of the subject and sale properties. The enterpiece of the work is a detailed presentation of the three approaches to value as they are applied to land-intensive properties in rural and agricultural settings.